Llanrwst: Accommodation, Attractions, Activities, Going Out, Shopping, Things to Do, Places of Interest, Outdoors, Llanrwst Holidays, Llanrwst Area Location, North Wales. Sometimes Llanrwst is called 'the capital' of the Conwy Valley, it is an ancient market town built on the banks of the River Conwy. The ancient three-arched stone bridge leads into a town made up of narrow streets with shops selling goods from everyday needs to home baked bread. There is something to suit all tastes in the variety of restaurants, bistros, cafes, take-aways and olde worlde tea-rooms. Plenty to explore in surrounging areas. Bodnant Caravan Park, Holiday Caravans- Maes Carafanau Bodnant Touring Caravans, Dormobiles, Tents, Holiday Caravans. Gwydir Castlel Conwy Snowdonia Bed & Breakfast, B & B, Accommodation in Llanrwst North Wales. Bron Derw Self catering apartment in wing of farmhouse in peaceful location in the Conwy Valley. Caravan storage also available. 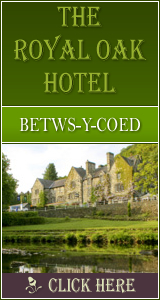 Self catering accommodation between Betws-y-Coed and Llandudno. The Old Ship Pub in Llanrwst is a great pub in the beautiful village of Trefriw, serving Real Ale and Homecooked food using as much local produce as possible.